Make the most out of your 12oz glass mason jars - either safely store your food with the airtight lids or use them with the straw lids + straws for your kids' or your favourite drinks. Safety is our priority and this is why we regularly perform external safety tests on our products to ensure they are 100% safe for our little ones. At J&G we are all about sustainable, innovative and safe products for our children. We want to ensure our children are eating and drinking from quality natural materials that are safer for them and our planet. - The straws are made from FDA approved silicone and are reusable, soft, flexible and even chewable, which is perfect for both you and your little ones mouths. - Our lids are made from non toxic plastic. There is no metal which most mason jar lids are made from which can easily rust and can be harmful. - A straw cleaning brush is included which allows for easy and hygienic cleaning of the inside of the straw. - The bright lids come with an airtight, watertight and leak-proof silicone seal. - Perfect for storing your homemade baby food, finger foods, snacks, yogurt, breast milk, powdered formula and much more. - 100% BPA, phthalate and PVC free and FDA food grade silicone straws. 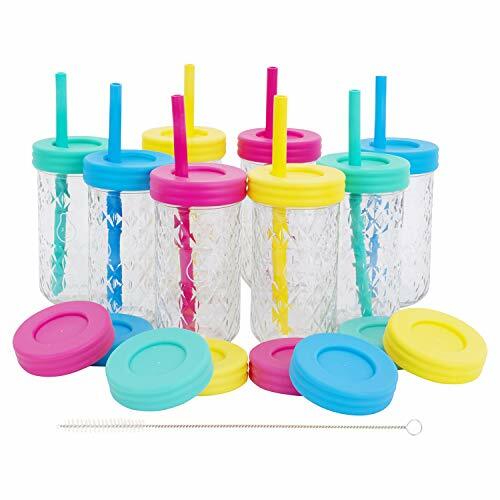 COMPLETE PACK: 8 * 12oz Mason Glass Jars + 16 lids (8 Lids with straw hole + 8 * leak-proof & air-tight lids) + Straw Cleaning Brush + 8 Silicone Straws (7.9"(L), 0.28"(ID), 0.39"(OD)). Bright and colorful lids, use for party drinks, toddler and kid's sippy straw drinks, food storage + more. NO RUST & NON POROUS: Durable and rust proof with these safe and non toxic plastic lids. Metal lids easily rust which can be harmful. These are GLASS jars - glass is safer as its non-porous surface doesn't absorb food and germs. Glass repels food odors which makes food and drinks taste fresher and fuller. VERSATILE: Great for Adults, toddlers (less spills) and kids drinks. Or use for food storage with the additional leak proof and airtight lids included. SAFE: FDA food grade silicone straw (which is soft and even chewable) + BPA, phthalate and PVC free lids and straws. All items are dishwasher, freezer and microwave safe (except lids). WHY J&G: We are all about our little ones food and drinks being stored and served from safe, non-absorbent materials which are innovative & ECO friendly. Our products complete safety tests to ensure they are 100% safe and have no nasty toxins. We also offer a lifetime guarantee - if you don't like our products then simply return them for a full refund.